Carpets serve as natural air filters in your home, trapping dust, allergens, and germs from the air and keeping them from your lungs. Over time, though, those particles can accumulate, and eventually, they can be released back into your home in greater concentrations. Many homeowners may not be aware of the issue and suffer the negative health effects without realizing there are simple solutions available. Some choose to hire a professional carpet steam cleaner to come to the home and clean the carpets for them. Others will either buy or rent their own steam carpet cleaner and struggle with the machine before finally throwing up their hands and calling a professional anyway. It’s certainly possible to steam clean carpet yourself, but it carries the same problems as hiring a professional carpet steam cleaner with the added hassle of wrestling with an unwieldy piece of equipment. There is a better professional solution available. When searching for a quality carpet cleaner, keep in mind that not all carpet cleaning services are created equal. There are several key factors that separate a high quality carpet cleaning process that delivers a healthier cleaning for your carpets and home from one that drenches your carpets with gallons of water and harsh cleaners. 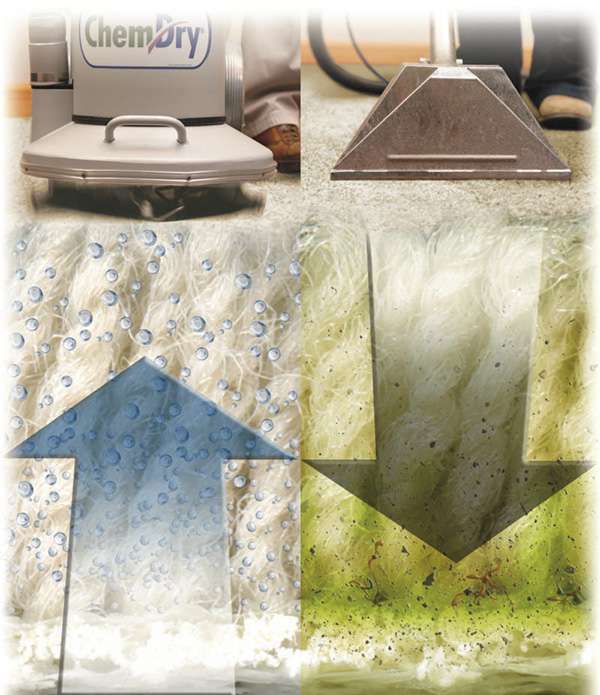 These factors explain why Chem-Dry’s unique hot carbonating extraction system offers a deeper, faster drying, healthier carpet cleaning experience than typical steam cleaning services. When you steam clean carpet, you saturate it with an excessive amount of water filled with soaps and detergents. This results in carpets that remain wet for 1-2 days, which creates a breeding ground for mold, mildew and bacteria. Plus the soapy residue left behind by carpet steam cleaners attracts dirt and causes your carpets to get dirty much faster. Chem-Dry’s process is different. Instead of soaking your carpets with water like a carpet steam cleaner, our process employs millions of microscopic bubbles to explode dirt from deep in your carpet fibers, so therefore we only need to use a fraction of the water that a typical steam carpet cleaner uses—almost 80% less in fact. We also use a natural carpet cleaner instead of a cleaner with heavy soaps and detergents. After the carbonation releases and lifts the dirt, our high powered equipment extracts the dirt and moisture from the carpet. While the drying time relies on several factors, such as humidity, airflow, and the carpet itself, the carpet will typically be dry within just an hour or two and ready for you to enjoy. 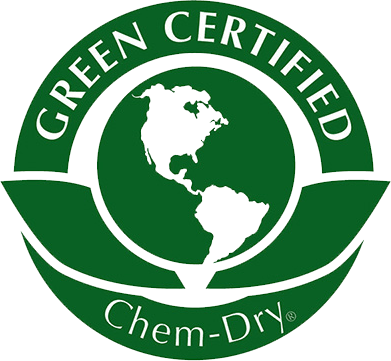 So while carpet steam cleaners use excessive amounts of water that often soaks through to the carpet backing and creates a breeding ground for mold and mildew, Chem-Dry’s low-moisture process doesn’t carry the same risk and offers a safer and more convenient carpet cleaning solution. Plus, your carpets dry in just a few hours, not 1-2 days like with typical steam carpet cleaning, and your carpet stays cleaner longer because there is no soapy residue left behind. The best way to decide whether to hire a carpet steam cleaner or to use Chem-Dry’s all natural process is to look at the two methods side by side. 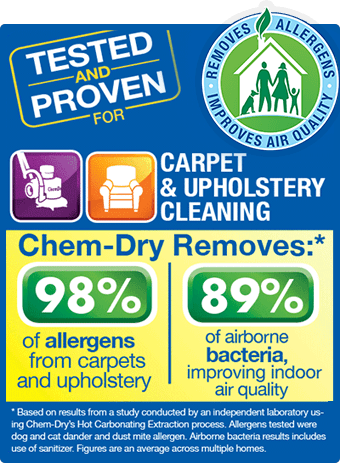 Take a look below to see a sampling of the benefits Chem-Dry carpet cleaning offers over steam cleaning. Up to 400 sq. ft. Combo rooms & areas over 225 sq. ft. are separate rooms. Good on residential orders only. Expires May/07/2019 Call Aladdin Chem-Dry at (314) 423-2800 or (636) 441-7750. Up to 1200 sq. ft. Combo rooms & areas over 225 sq. ft. are separate rooms. Good on residential orders only. Expires May/07/2019. Call Aladdin Chem-Dry at (314) 423-2800 or (636) 441-7750. Did you know our core solution is Green Certified?